Enter central stage…Tropical Storm Debby. The hurricane hunters went out this afternoon into the central Gulf of Mexico and found a rather ragged system with multiple areas of rotation. As the satellite imagery shows below, the system is VERY ragged tonight with almost all of its convection to the east of the center. Between buoys, recon, and satellite, observations show a number of centers and low level swirls. The scatterometer imagery that has come in today has shown a stretched main circulation that is distorted from northeast to southwest. Trends tonight on IR have shown a number of circulations, at the lower and mid levels, relocating and dotting the area to the northeast of the dominant center. 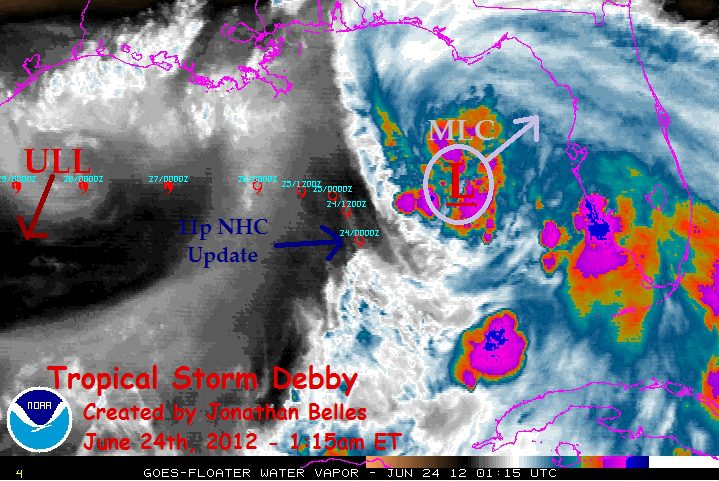 As of 11pm, Debby was stationary at 26.3N 87.5W with a pressure of 998 mb and winds well removed of 50 mph. The current forecast track brings a left turn over the next day or so, and then heads almost due west to the Texas coastline as a category 1 hurricane, the second of the season. A quick look at water vapor imagery shows that there is an ULL sending in an unordered package of wind and shear from off the coast of Texas. That ULL is slowly sliding to the south-southwest, which should open the door to some modest strengthening. As Debby strengthens it will begin to feel the effects of the continental high pressure system that sits over the south-central US, which will guide Debby westward. In a typical situation, approaching systems to the Texas coast generally make a rightward turn as they approach the coast, but I think in this case with a strong high pressure system there may be a bit of a left turn into southern Texas. This scenario closely follows the Euro, and south of the hurricane models. The side show: When tracking a tropical system in the Gulf, one of the first decisions meteorologist have to make is if it will go to the west, central, or eastern Gulf, and who will get most of the impact. In this case, just about everyone will get a piece of Debby. As the GFS has shown for days, a piece of energy seems to be breaking off and spreading to the northeast toward Florida. This area is highly convective and it shows no signs of giving up. I am half expecting a new system to develop here over the next couple of days before it falls apart along the trough in the Atlantic. The bottom line in terms of impact is for heavy rain and isolated tornadoes on the west coast of Florida, the big bend, and along the panhandle. Rain totals could reach 3-6″ in spots over the next 48 hours. A Tropical Storm Warning is in effect for the eastern half of the Louisiana coastline from Morgan City eastward. This area should expect tropical storm force winds, winds greater than 40 mph, to begin on Monday during the morning hours. These warnings will be expanded westward with time. Rainfall will be the biggest player for Debby, and just about everyone along the gulf coast will see some over the next week from her. Depending on the strength of Debby in a couple of days mild surge with added higher tides are possible from Louisiana westward to the point of landfall. Waterspouts and isolated tornadoes are possible across western Florida and the west coast of Florida tonight and into tomorrow. The formation of Debby on Saturday came 60 days ahead of schedule and marks the first time the fourth named storm of the year occurred in June. Previously the record for earliest fourth storm of the season was held by Dennis in 2005, which occurred in July. Climatologically the “D Storm” would occur on August 22nd. On a personal note, I will be working nights for the next week, so I will not be updating overnight and through much of the morning. Updates here will likely occur close to 10pm on work nights or later on off nights. Twitter updates could occur at any time. A 2am update will be produced on twitter with the latest from the NHC. Posted on Sunday, June 24th, 2012, in Tropical Weather. Bookmark the permalink. Leave a comment.